Biosolids recycling is an integral link between sustainable soils, communities and economies. When organic materials such as biosolids are recycled into products of value, everyone benefits. A wide range of options are available to local governments to decrease, reuse, recycle, and compost organic materials. Communities that have implemented only some of these programs may find that adding organic recycling programs that pay off large dividends quickly for greater landfill waste diversion. As part of the circle of life, every community of any size must process the sewage and wastewaters generated by its population and recycling biosolids for added benefit to agriculture and horticulture makes sense. Created during the past 30 years, the biosolids process has resulted in the rapid and remarkable cleansing and restoration of America’s rivers and streams. Land application of biosolids costs less than half of the next available alternative (usually using landfills). The savings realized by municipalities are passed on to communities in the form of reduced taxes along with lower sewer and water bills. More than $2 billion is spent annually treating and managing approximately 5.3 million dry metric tons of biosolids from publicly-owned wastewater treatment plants in the United States. Because land application is considerably less costly than the next available option, significant savings are realized and passed on to consumer’s directly through reduced utility bills and even indirectly through lower prices of products which must cover utility costs. Farmers can save up to $150 per acre by using biosolids to amend their soils over chemically produced fertilizers. This translates into thousands of dollars per year depending on the amount of land utilized. This support of local farmers allows them to produce crops more affordably, which keep the prices at the grocery store down. Rich in plant nutrients, most recycled biosolids arc land applied on farms and forests as fertilizers and soil conditioners. Smaller quantities are sold as fertilizer and compost through home and garden centers and landscaping services. Studies have shown that biosolids are safe to recycle and beneficial for soils and the environment. 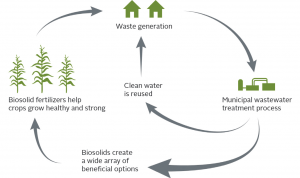 Biosolids are nutrient-rich materials created through multiple processes and scientifically-advanced treatment of sewage sludge generated by thousands of municipal water treatment plants all across the country. Biosolids are created when residue is processed according to specific national safety standards. They can then be safely applied to land as a fertilizer and/or soil conditioner to improve and maintain agricultural and forest lands as well as to restore damaged acreage. Since every community of any size must process the sewage and wastewaters generated by its population, recycling biosolids for added benefit to agriculture and horticulture is an environmentally-responsible alternative to landfills and incineration. The benefits and safety of biosolids for agricultural use are well documented by decades of scientific studies and the practical experience of thousands of farmers. Biosolids contain many essential plant nutrients to stimulate plant growth and to improve and maintain productive soils. Organic matter in biosolids improves the quality and structure of soil, reduces compaction and increases waterholding capacity – a critical benefit for plants during times of draught. Farmers report that biosolids application significantly increases productivity of their land – as much as double in some areas of the country. The preponderance of scientific evidence and practical experience demonstrate that biosolids are safe for humans and animals. Land application of biosolids greatly benefits the agricultural community and the environment by recycling valuable nutrients rather than wasting them in landfills or incineration. The agricultural use of biosolids helps preserve rural open space and helps protect waterways by enriching soils and helping vegetation grow more vigorously through reduced soil erosion and stabilization of contaminants that have previously contributed to stream and groundwater pollution. Cities and towns that generate biosolids and the farmers and companies that land apply biosolids are responsible members of the environmental protection community. Federal, state and local regulations effectively protect the health and safety of the public.